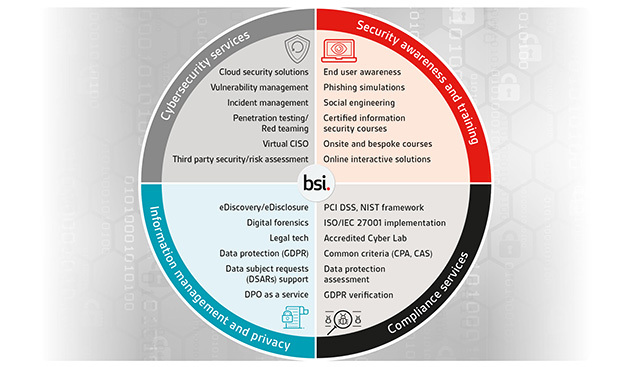 BSI Cybersecurity and Information Resilience delivers end to end eDiscovery solutions from Digital Forensics Investigations through to the full complement of professional litigation support services with Relativity. BSI supports in-house counsel, law firms, corporations and government agencies through unrivalled experience and leading best practices. BSI is the business standards company that helps organizations all over the world make excellence a habit. In 182 countries, at more than 128,000 sites, we work with thousands of organizations, from the world's largest and most successful brands to local small businesses. Our clients look to BSI to manage the complex issues associated cybersecurity, information resilience and the full spectrum of the EDRM processes, expert witness and a range of other legal and business challenges within regulatory and non-regulatory environments. Committed to superior service delivery and long-term value, our highly qualified professionals use the most advanced technologies available to collect and analyse information quickly and accurately, enabling clients to make informed decisions for their specific requirements.